Mix Juice Green Energy Drink is packed full of flavour. This one won’t give you an energy boost – but it will rejuvenate your taste buds and refresh your senses with it’s awesome, full flavour. Based on popular energy drinks, this is an extremely good re-creation – without the caffeine come down! 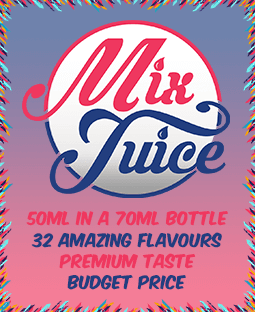 You can buy your Mix Juice Green Energy Drink on its own, nicotine free or you can add 10ml or 20ml or Nic Shot to create your desired strength.